What is a garden? Julie Moir Messervy describes a garden as "a state of mind; a site that resides in your imagination." (The Inward Garden: Creating a Place of Beauty and Meaning, Little, Brown and Company, 1995) Each year in December, families create a garden inside their homes when they select a tree, load it onto the roof of the car, rearrange the furniture, pull out the boxes of lights and ornaments, and generally savor this horticultural focal point of festivities. We're surrounded by evergreens in western Massachusetts. Pines, firs, spruces, hemlocks, hollies, junipers all can be found in our biologically diverse, Zone 4-5 landscape. We might not even think much about these beautiful trees, except perhaps in December when we carefully select the perfect Christmas tree! I love the idea of trees almost as much as I love the reality of trees: the smells, the feel, the green, the decoration, the majesty, and the way trees symbolize both connection to the earth and reaching for the heavens. So, I still get excited about bringing a tree into my home every year for the holidays. I'm not the only one. n case you are interested in the origins of this particular custom, the Germans were the first Europeans to initiate a tradition of Christmas trees. In 1846, the popular British Royals, Queen Victoria and her German Prince, Albert, were pictured standing with their children around a Christmas tree. Victoria was so popular with her subjects that what was done at court immediately became fashionable, not only in Britain, but with fashion-conscious East Coast American society. The English Christmas tree had arrived! On this side of the Atlantic, Franklin Pierce, the 14th president of the United States, in 1856 was the first chief executive to place a Christmas tree in the White House. President Coolidge started the National Christmas Tree Lighting Ceremony on the White House lawn in 1923. In 1902, President Theodore Roosevelt wanted to teach his children the importance of conservation and reportedly forbade them to have a Christmas tree, saying, "It's not good to cut down trees for mere decoration. We must set a good example for the people of America." However, he was convinced otherwise by Gifford Pinchot, cabinet member and founder of the Yale School of Forestry, who assured the president that forests actually benefited from thinning. I spoke recently to Master Gardener John Barry from Gill about his experience growing Christmas trees. I asked John what he liked most about the business. "The best part of growing Christmas trees is the pruning part . . .taking an otherwise unruly looking tree and turning it into a well-shaped plant is great. I do this usually in late October/November when it's cooler and the bugs are gone. If you are growing pines the pruning must be done between June 15th and July 15th. Sooner, you get erratic growth or later, you get straggly growth. I fertilize in April with just a simple 10/10/10 application." As for what he likes least about the business: "Harvesting and/or selling the trees is my least favorite job." John's favorite tree: the fir. "Among the firs, Balsam and Fraser are the best. They look good, smell good, and are easy to prune." 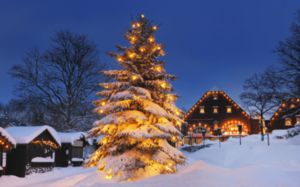 The best-selling Christmas trees in America are Scotch Pine, Douglas Fir, Noble Fir, Fraser Fir, Virginia Pine, Balsam Fir and White Pine, all evergreen conifers from the pinaceae family of plants. Abies (Fir), Picea (Spruce), Pinus (Pine), and Pseudotsuga (Douglas Fir), as well as Tsuga (Hemlock) are all in the pinacaea family. Joel Fowler, Master Gardener Intern, gave a talk on conifers at the October meeting of the Northfield Garden Club and explained that conifers are gymnosperms, which means they propagate from cones or berries instead of flowers. Instead of leaves, they have needles or scales. Joel also notes that not all conifers are evergreens (e.g. the larch or tamarack), and there are evergreens that are not conifers; the holly, for instance. The White Pine, Pinus strobus, is the largest pine in the U.S. and has soft, flexible needles. It is bluish-green in color, its soft needles are 2 - 5 in. long in bundles of five. White Pines have good needle retention, but little aroma. They aren’t recommended for heavy ornaments. However, White Pine is known to provoke fewer allergic reactions than some more fragrant trees. Scotch Pines, Pinus sylvestris, have needles about 1 in. in length that stay attached even when dry - something busy homemakers might especially appreciate when considering which tree to pick. The tree is a bright green color, has an excellent survival rate, and for all the Teddy Roosevelt admirers out there, is easy to replant. Its open, stiff branches provide lots of room for ornaments, and Scotch Pine keeps its aroma throughout the season. Fraser Fir, Abies fraseri, branches turn slightly upward. They have good form and needle-retention, are dark blue-green in color, and have a pleasant scent. The flat needles are ½ to 1 inch long. The branches are pyramid-shaped and strong. The tree was named for John Fraser, a botanist who explored the southern Appalachians in the late 1700s. Concolor Fir, Abies concolor, or white fir, is gaining in popularity as a Christmas tree variety. Native to the western United States, concolors can grow to 130-150 ft. in height and 3 to 4 ft. in diameter and may occasionally survive to 350 years of age. It produces a spire-like crown with a straight trunk, small, narrow bluish-green needles which occur in rows (1/2 to 1 1/2 inch long). 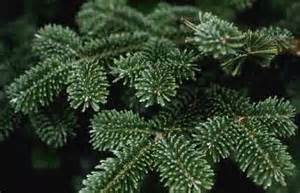 Douglas Fir, Pseudotsuga menziesii, has soft, dark blue green needles (1 - 1 ½ in. in length) radiating in all directions from the branch. Douglas Firs have a good conical shape and are known to live for as much as a thousand years. The crushed needles have a sweet fragrance. They are one of the top Christmas tree species in the U.S.
Last but not least, there is the popular Blue Spruce, Picea pungens, known for its dark green to powdery blue, very stiff needles and good form. 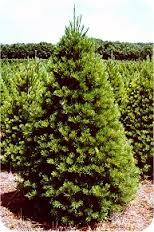 Blue Spruce will drop needles in a warm room but is best among this species for needle retention. The branches are stiff and will support many heavy decorations. Another long-living tree, the Blue Spruce is known to live in nature for 600-800 years. Dig the hole before the ground freezes and cover with enough straw or mulch to keep the soil from freezing; also, protect the fill soil from freezing so it can be used for planting the tree after Christmas. Base the selection of the tree on more than shape and color. Living trees can be balled and burlapped (B&B), container grown or potted. Small trees are almost always a better choice than large trees because they are easier to handle and move, and because you have a higher probability of the tree having a sufficient root system to support it after planting. Pay attention to the root portion of the plant; the pot or ball should match the size of the tree. B&B stock should have a solid ball. Potted stock should not be rootbound or too small to support the top portion of the tree. Purchase or dig up the tree one to two weeks before Christmas, and store in a cool but not cold location. Keep the pot or soil ball cool and moist, but do not allow it to freeze; ideal storage temperatures would be from 33 to 45 degrees. A mulch of straw may be used to keep the soil ball or pot from freezing. Plan to keep the tree in the home for as short a time as possible. The maximum time allowed in the house is five to seven days; the longer it is kept in the house, the greater the risk of failure. If kept inside too long, the tree begins to grow and is damaged or killed when planted outside. Remember the tree will need adequate water inside the home. The soil ball or pot should be kept moist but not wet; wrap the soil ball or pot in plastic or place in a tub while it is in the house to avoid damaging the floor or carpet. Check the soil ball or pot daily, and water when it becomes dry.